Sagrada Familia Barcelona. The Sagrada Famila (Sacred Family) temple is the world famous unfinished church by Antonti Gaudi. Its full name is Temple Expiatori de la Sagrada Familia. Don't miss seeing Barcelona's most famous church, La Sagrada Familia basilica, which was designed by the Spanish Catalan architect Antoni Gaudi. A good tip is to buy Skip-the-line Sagrada Familia tickets in advance to avoid long lines. The Sagrada familia is unfinished but still Barcelona's most famous landmark and the most visited tourist attraction in Barcelona. La Sagrada Familia temple is also a location in bestselling author Dan Brown's new book 'Origin' released in October 2017. The construction of the incredible Sagrada Familia temple started in 1882, when Gaudi agreed to work on a project for a new and magnificent church in Barcelona. It is still not finished. In 2013 about 65% of the temple had been completed. It is hoped that the church will be finally finished in 2026, which will be 100 years after Gaudi died. The current lead architect is Jordi Faulí who leads a team of 40 construction workers. Faulí is the ninth generation of architects to lead the building work. It is expected that he will be the final architect, when this magnificent temple is finally finished 144 years after the building work started. On 7th November 2010 Pope Benedict XVI visited Barcelona to consecrate the Sagrada Familia as a basilica. 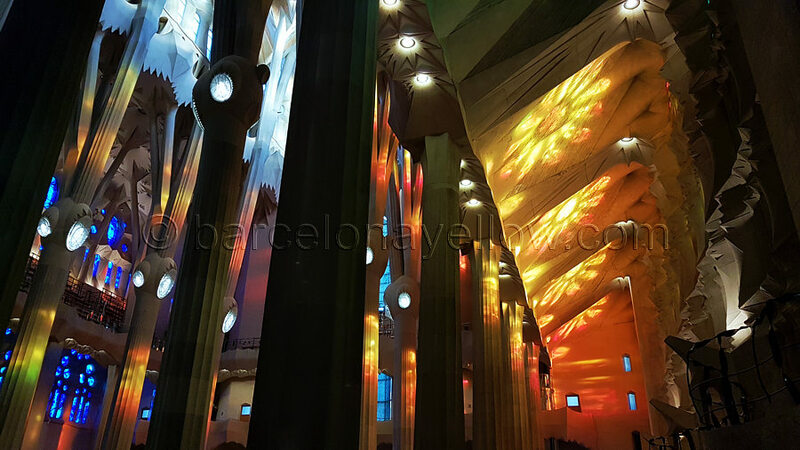 Visit the Sagrada Familia website for worship times, masses (missa) and services. The waiting time to buy entrance tickets can be up to 1 hour, especially in peak season. Buy Sagrada familia tickets online. Or book a Gaudi & Sagrada Família Tour which includes skip-the-line admission. YouTube how finished Sagrada Familia will look.